Amazon introduced a couple of big perks to the Prime membership in the past year. For $79 a year, you can get free two day shipping along with free book and movie rentals with Kindle Owner’s Lending Library and Prime Instant Video. The Kindle Owner’s Lending Library allows one book checkout a month, and includes a fairly good sized collection of books. I’ve checked out a couple of them so far and have enjoyed having this option. The latest news involves the Prime Instant Video collection. Amazon just announced that they sealed a deal with Viacom, which means that they now offer TV shows from hit networks such as Nickelodeon, Comedy Central, TV Land, MTV, and VH1. When Prime Instant Video first started, there wasn’t much of a selection, but it now offers around 15,000 titles and is well on the way to giving Netflix a run for its money. There are shows for kids like Spongebob and iCarly, as well as Dora the Explorer. Adults can check out Glee, Lost, 24, or The Wonder Years. Newer shows still have to be purchased or rented, but aren’t limited to Prime members. Prime Instant Video can be accessed on a Mac or PC, an internet enabled TV, or on the Kindle Fire. 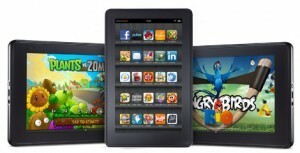 With the videos on the Kindle Fire, you have a lot more portability as long as you have access to wi-fi. Amazon includes step by step instructions on how to access and download movies and TV shows here. Amazon’s streaming video collection is growing rapidly. Netflix is still ahead since it includes unlimited DVD by mail, but I don’t think it will be long before the two are in fierce competition with each other. So, keep tabs on Prime Instant Video. Amazon is constantly adding new titles, and working out deals with major production companies.